The University of Nebraska leads the nation’s Division 1 colleges and universities with 65 CoSIDA First-Team Academic All-American football selections. These classroom All-American selections are made by the College Sports Information Directors of America, with the process going back to Nebraska’s first in 1952. Of this impressive number, Dennis Leblanc has had the pleasure of assisting and guiding 33 of them (as of this printing). That’s not just a coincidence, folks. Where there’s smoke there’s fire, and Dennis has been known to light a few under some young men’s rear ends over the years. A confident, soft-spoken guy who carries a helluva big stick, he is the second half of the dynamic duo in Nebraska’s Academic Study Center along with Keith Zimmer, who we spoke with earlier. Let’s get Dennis’s perspective, which I am certain will be an interesting one at that. Question: Hello, Dennis, your name comes up with great regularity when I ask a lot of former players to name someone who meant a lot to them as a Cornhusker athlete. I hope you’re honored by that. Dennis Leblanc: Well yeah, sometimes you wonder if you’re creating more enemies than accomplishing things with those guys, (laughs) because our job sometimes is not the most glamorous part of it, because you’re trying to get people to do things that they don’t get a lot of praise for. Q: I understand. So first question: tell me, where did you grow up? DL: I grew up in Clifton, Kansas, north central Kansas about 20 miles east of Concordia. Just about two hours from Lincoln. Q: How did you end up in Lincoln? DL: Well, I was working on my Masters Degree at Wichita State University in 1982 and I had to do an internship, and I thought that I’d like to be an athletic director someday. And I’d read an article that Bob Devaney and Deloss Dodds were considered to be two of the top athletic directors in the United States and knew that Lincoln was not that far away. I thought it made more sense financially to move to Lincoln and such. I was a track athlete in college at a small school called Bethany College in Lynchburg, Kansas, and so I was very interested in track. I came up and visited with Gary Pepin at the time and asked him if he had anything available and he said, “We’d love to have you come work.” And I found out later that he didn’t pay anything. (laughs) But I also found out later in my career just to have an opportunity to work in the athletic department at Nebraska was worth more than any payment I could have received. So that’s how I got to Nebraska. I worked in the track & field office and finished up my Masters Degree, and then moved over into the Academic Center in 1987. Q: And how did that occur? DL: Well, there was a position that came open. I was handling the recruiting for track & field at that time and I decided that I really didn’t want to stay in coaching and recruitment and have to travel like that, and this position came open. It was a godsend for me as far as athletics, but working with student-athletes in a different way. And I never really thought of being on the academic side until this position came open. So I visited with Al Papik, who was a former track coach at Doane College plus football coach. And I got his advice. He said, “I think it would be something that would be a good fit for you. Why don’t you apply and see what happens.” So I threw my name in the hat and that was history. Q: So that was in 1987. Was that when Dr. Ursula Walsh had left to work for the NCAA? DL: She actually left in, maybe, 1985. Al Papik took over, so in ’87 when I came over here to visit with him, Al had moved into the compliance area, which was a new position. The NCAA was just kind of telling schools they had to be compliant with the rules, so Al moved into that area. Al hired Roger Grooters to take over the Academic Center. So it really became Ursula, then Al, then Roger. And Roger left in 1993. Q: Roger went to Florida State, right? DL: Yes. So he left in ’93 and at that time I had the opportunity to take over as interim, and eventually got the position. Q: So what is your official title now, Dennis? DL: Senior Associate Athletic Director. I oversee the Academic Center, which is still what I am most involved with on a daily basis. I still operate very much the same way I did in the past, but I also supervise the compliance area. I supervise Josh White in that area. DL: Probably my first thought of Nebraska football -and I’m trying to remember when I came here in ’82- I actually worked some combined time as an intern with promotion and fundraising for women’s athletics and with the track program. And my office, per se, was working out of Joyce Johnson’s office, and her office was right next door to Bob Devaney. 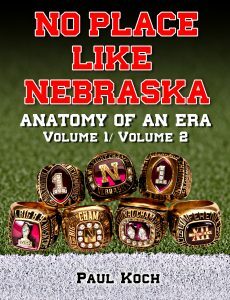 So, being from Kansas, I’d read about Bob Devaney and I guess I didn’t know he was such a legend, and until you actually move to Nebraska you don’t really understand it. So when I’d see him in the mornings, that was my first thoughts about Nebraska football, was having that office just around the corner from his. What an interesting and great man. I remember taking a track recruit into him one time (laughs) and he said to the athlete, “Where else are you looking to go to school other than Nebraska?” And the young man said, “Kansas.” And Bob said, “What the hell are you looking at them for?! They’re not any good in track.” Only Bob Devaney could get away with something like that. (laughs) And then, you know, that year was the year that Turner Gill was the quarterback and Mike Rozier and, of course, Irving Fryar. And I don’t know if you remember that poster, the Scoring Explosion, I remember that fall I took it upstairs and somebody got signatures from all those guys and I took it back and gave it to a young boy in my hometown. So anyway, that was my first idea of remembering getting to know Nebraska football. Q: Any recollections of the first time meeting Coach Osborne? DL: Well, I tell you what, I’d probably walked by him before, but to tell the truth, the first meeting was interviewing for the academic job in 1987. I had an interview with him and he was asking questions of why I wanted to get out of track & field and move into this direction. And I don’t remember what I told him, my eyes were probably as big as quarters because I was sitting there talking to Tom Osborne. But you could just feel the respect for him wherever you went in the Athletic Department and the state of Nebraska. 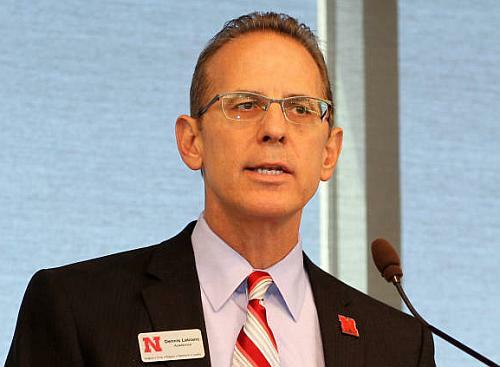 I knew that if I was going to take this job that there was a huge obligation to the program, to the student-athletes and to the University of Nebraska, to make sure that I served the student-athletes with integrity and loyalty, and in a way that, sometimes they might not always like what I was telling them. But I always had their best interests in mind. Q: In retrospect, years later they probably appreciate you a little more, right? Your rigor and discipline and oversight on their behalf? DL: Yeah, and you don’t realize that until you’ve had somebody leave and maybe after a while they come back and they say, “You know, Dennis, I’m sorry I was such a knucklehead when I was here,” you know? (laughs) And that’s actually what’s made it fun, to know now that there were maybe some guys at the time you didn’t really think liked you a whole lot -and they probably didn’t- but as they matured and grew up they understood what we were all trying to do. And I’m not just talking about myself, I’m talking about everybody who was involved in the program. The one thing I always tell people when they ask me about Tom Osborne, the one thing I remember was he’d always have a meeting at the beginning of the year and have everybody together and talk about needing to be on the same page and working on the ultimate goal of developing these young men, that championships aren’t the most important: “If the championships come, that’s great.” I remember looking around that room and seeing George Sullivan and Boyd Epley, all the people of Academics, Sports Information. What he was telling us is, “Everybody in this room has your job, and it doesn’t matter if you’re the academic person or the assistant strength coach, you have your job and it’s a very important part of the entire operation. And we cannot do this without everybody in this room. So don’t worry about what everybody else is doing. If they need help, take care of them, but if you’re doing your job everything else will take care of itself.” You know, don’t worry about who’s going on a trip or who’s getting this, just do your job. So you felt as if… and you were, you were an important part of it. Not that you needed that to be able to come to work every day, but that was the enjoyable part about working in athletics, because every year it kind of starts over and you have goals you set for yourself in your job, your department has goals, and it’s fun to strive for those. There are very few places you can feel that in your work beyond athletics. Q: Because every year starts anew, a fresh start to see if you measure up. What goals did you have set for yourself, for the Academic Counseling department? And the students, as well, when you’re really dealing with student-athletes -and I’m mainly dealing with just the sport of football- they come to you in three different categories: One, where they come to you and they’re focused on staying eligible. Two, you have the ones who are focused on getting a degree (but maybe that’s where it ends, they don’t understand anything beyond that). And three, you have the athletes who understand they’re gonna get a degree and then get the skills to go out and get a job when they’re done. My job, and Keith’s job, is to move the individuals of the one group into group two, and the two’s into group three. So you get them into the phase where they understand graduating is important, and then you move them to the phase where, “Not only am I gonna get my degree”, but “the world is not gonna just hand me things when I walk out with my diploma, I’m gonna need some skills when I leave here.” And that’s really where Keith has taken the Life Skills area to another level. Q: So, is it fun to work with the athletes in any of those three areas? DL: Absolutely. And some? You may get them in the eligibility phase and only get them to the graduation phase by the time they leave here. And maybe you’re continually working with them after they’ve left Nebraska. You know, through the process they finally realize five years out, they realize that “football isn’t going to be a 15-year career for me. I have to be able to capitalize on all the skills I learned through athletics to be able to get out there and compete for a job.” There are so many things that are learned through a sport that can be applied in the workplace and can make athletes outstanding employees. Q: What methods did you use to get these athletes to change and mature in their mindset? DL: Well, every one of them is different, so you really have to get to know them. So that’s a process. Sometimes I wish I could get to know them more personally, but what it takes to motivate one individual is similar to coaching. What works for one might not work for the next kid. And it’s very important to me to have a staff that is made up of individuals who will have the ability to reach different people. Maybe if I can’t reach someone Keith Zimmer or Alvin Banks or a number of others can. Q: How many folks were under your supervision? DL: When I started in ’93, and it’s hard to remember, Keith and I and Sonya Varnell and Trina Kudlacek, that might have been in it. And then we had an intern, and then our staff grew over the years. DL: Yeah, and just like anybody in athletics, I really try to approach my job -because I grew up in the track office watching Gary Pepin operate who, like all great head coaches, have similar characteristics in that they’re very focused on what they’re doing- they’re able to see into the future of what things need to happen and they’re able to work backwards from that ultimate goal and determine the steps along the way to see that. So I saw Coach Pepin operate like that, and then having the opportunity watch Coach Osborne work, watching him more directly. You really try to operate this area like a coach would, in that you did not want to leave a stone unturned as far as making sure you had all your bases covered.